HARTFORD – House and Senate Republican leaders today said the pending financial bailout contract between the state and Hartford should be scrapped and that the original budget agreement approved last fall to provide an additional $40 million in municipal aid for the city in each year of the biennium be honored. State Rep. Themis Klarides and State Sen. Len Fasano asked Democratic leaders to join them in asking State Treasurer Nappier and OPM Secretary Benjamin Barnes not to enact the agreement. The exact terms of the deal, negotiated between Democratic Hartford Mayor Luke Bronin and Gov. Malloy’s budget office over the last few months, do not reflect the agreement legislative leaders reached last fall on the budget. Of the $40 million, $20 million was to be used for debt service. 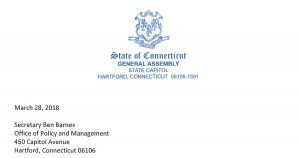 “We are writing to you to emphatically request that you do not sign the financial assistance agreement between the State of Connecticut and the City of Hartford. Should you ignore this request and move forward with signing the agreement, we want to make it clear that we intend to reduce Hartford’s operating aid and ensure that the state is holding true to its commitment in the bipartisan state budget to only approve the $40 million agreed to,’’ the Republicans wrote to Barnes and Nappier. Bronin and the City Council have put the state’s obligation over 20 years at more than $500 million. That figure was not part of any budget negotiations last year. Included in the letter is a chart that shows how much debt service the city could expect to pay through 2036 and how much would need to be cut to comply with the terms negotiated by Republican and Democratic leaders.